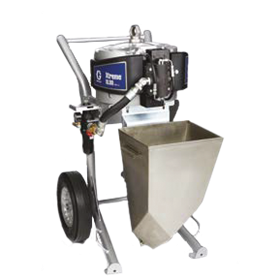 Hopper Sprayers are used to spray cement mortar mix onto 3-D panels. The small spray gun gets the job done. You can dip it directly into the wheel barrow for the cement just as if it were a shovel. The worker will dip the hopper sprayer into the wheel barrel to pick up more cement mortar; a small air line is connected to the handle and goes to the air compressor. Spraying Portland cement with a hopper sprayer. This sprayer is inexpensive and will run off a normal air compressor. For further information about hopper sprayers and for orders, please contact us.